Faial is the third most populous island in the Azores archipelago and is known locally as ‘The Blue Island’ due to the hydrangeas covering its hilly landscape. However, the most dominating feature is a magnificent volcanic crater called ‘the Caldeira', measuring 1,043 metres high, 1.5 kilometres wide and 400 metres deep. On the west coast, you will find the Ponta dos Capelinhos lava fields and the ruins of an old lighthouse which resulted from the 13 month-long eruption in 1957. Most of Faial's ports offer excellent conditions for windsurfing, whale watching and sports fishing, with big game species such as blue marlins and bluefish tuna regularly caught in the high seas. The small town of Horta’s marina was built in 1876 and is the fourth most visited in the world due to its prime location between the Mediterranean and the Caribbean. The port’s sea wall is decorated with hundreds of colourful paintings and calling cards left by visiting yachters. Also, the scrimshaw museum is now a mandatory point of reference for trans-Atlantic sailors. The town itself is one of the most lively and eye-catching in the archipelago, boasting a cluster of convivial bars and cafes frequently visited by storytelling sailors. Horta becomes even more vibrant during the ‘da Nossa Senhora das Angustias Festival’ when a large procession fills the streets in celebration of the sixth Sunday after Easter. 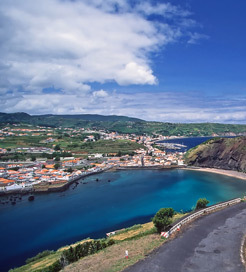 Characteristic of all the Azores Islands, the cuisine on Faial centres on fresh seafood. Stewed octopus in wine with locally baked cornbread is a local favourite and a cream-filled pastry called ‘Fofas do Faial’ is a popular dessert. You can sail to the Port of Horta from the Azores Islands of Flores, Sao Miguel, Terceira, Pico, Sao Jorge, Graciosa and Santa Maria. With at least one crossing provided every week, exploring this beautiful archipelago couldn’t be easier. For more information, please visit our Ferries from Pico to Faial page. For more information, please visit our Ferries from Flores to Faial page. For more information, please visit our Ferries from Sao Miguel to Faial page. For more information, please visit our Ferries from Terceira to Faial page. For more information, please visit our Ferries from Sao Jorge to Faial page. For more information, please visit our Ferries from Graciosa to Faial page.